We had a small door by the side porch that corresponded to a small door in the kitchen wall. On hot days the driver was nice enough to chip some chunks of ice for us kids. We'd lay on the sidewalk licking on our crystal clear chunck of ice. Great days back then. Thanks for that informative post, Buickman. I enjoyed reading it. 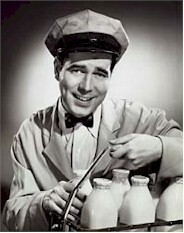 I spent a couple of summers working on a milk truck in the early 60's. We loaded the milk and iced it down as a refrigerated truck was somewhere in the future. The driver drove and kept records while I ran the milk and empties back and forth. We tried to predict what the customer wanted to save walking back and forth. Some places had an insulated box, some not. Some even left a door open or gave us a key so we could put the milk into their refrigerator. The only scrap we left behind were the caps since the bottles were washed and refilled at the dairy. In the front of the truck was a small icebox where we kept eggs, cottage cheese and sour cream. We also carried half-pint bottles of chocolate, regular and buttermilk to sell at factories when they took their morning/lunch breaks. We were the precursor of the lunchwagons that are still in use today. Great memory pulling the cardboard stopper from the glass bottle and licking off the cream that had congealed underneath. Those were the pre-homogenized days. At first we had the glass bottles, paper stoppers, in winter they'd pop up, later we had a box by the front door, and they say unemployment's bad! there's jobs right there! Duh! So did we. In fact, we had two. My brother and I broke the first one, so the company replaced it free of charge. Milk was still delivered in glass bottles until I was about 9, and then they switched to paper cartons before stopping the service altogether. 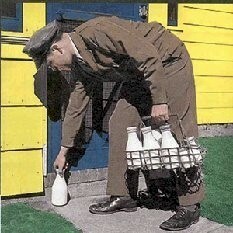 We had a "milk" box that sat on the front porch that the man would put the milk in.